A beautiful open floor-plan home with just over 1800 square foot and tasteful interior design boasts a Master Suite featuring a King bed with a 32 inch Flat-screen TV. The second bedroom has a King bed, the third bedroom has 2 Full beds, and bedrooms have Flat-screen TVs. This impressive home sleeps a total of 10 guests. The comfortable living area has a Sofa Sleeper; a Flat-screen, 50 inch, Plasma TV; an desk with printer; free WiFi internet access; DVD Player; and cable TV. The kitchen is equipped with all modern day touches anyone would wish for like granite counter tops, stainless steel appliances, full-size dishwasher, microwave, garbage disposal, coffee maker, and full-size refrigerator with an ice maker in the door. The in-unit laundry room was a full-size washer, full-size dryer, iron and ironing board. High speed wireless internet access throughout the unit is free, including free local phone service. This condo is located minutes away from Disney World, Sea World, Universal Studios, Wet N' Wild, and walking distance to the Orlando Orange County Convention Center. This condo is an ideal choice for either the family wanting to be close to all the excitement of International Drive, couples getting away for a short break, as well as the discerning business traveler in town for a meeting or a big convention. One stay at this unit and you will want to come back again and again. When you stay with us at Vista Cay Resort a peaceful and picturesque resort awaits you and your loved ones! Just minutes away from any of the three major theme parks and adjacent to the Orange County Convention Center in Orlando, FL, Vista Cay Resort is a perfect place to base your vacation from. Stroll down International Drive for an afternoon of shopping at the numerous outlets. Enjoy the abundance of dining and entertainment options while you reconnect with family and friends or make new connections with business accociates or fellow enthusiasts. Whatever you pleasure we make it our business to provide an enjoyable and rewarding stay for you and guests. You'll instantly feel at home in our clean, comfortable condos and townhomes. We provide towels, sheets, blankets, pillows, utensils, dishes, pots and pans -- all the amenities you need for a relaxing retreat. 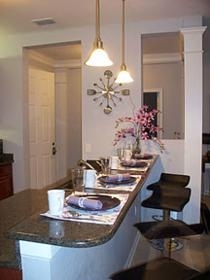 Our condos and townhomes can accommodate up to 12 overnight guests, depending on the condo and/or townhome purchased. While not all of our condos and/or townhomes are pet friendly, we do have several units that are pet friendly and will make every member of your family feel at home.
. Located at 4874 Cayview Ave, Orlando, Fl. 32819. You will be 15 minutes from Disney World�, 3 miles from Universal Studios�, and 1 mile from SeaWorld�, within walking distance to the Orange County Convention Center, and the dining and entertainment offered on the famous International Drive. Contact Owner for Standard Rates Detail.